Well, this movie is good for only one thing: ROBOTS! If you want to see ROBOTS then definitely rent this film! There’s some trifling love story and some blonde chick with long legs that provides some minimal eye candy but who cares about that? BRING ON THE ROBOTS, I SAY! There aren’t any extras on the DVD (would have liked to see some behind the scenes action of the voice actors or even a blooper reel). How many Star Trek references can you find in this movie? 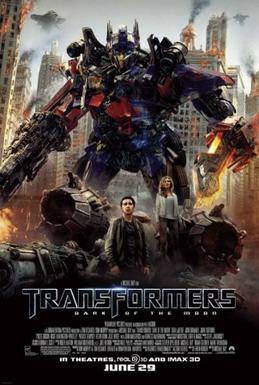 Debs G recommends: Watch this with Pacific Rim for more Gundam Funtimes and the shrieking sound of metal scraping metal! The one thing, and almost the only thing, that I hate about vacations is the packing. Here I am, ready to take a much needed stress relief break from work and I am never sure exactly what I want to bring with me. That, and I can never figure out how to fold things to maximise the use of space in my suitcase. Packing Pro. Plug in the numbers and hope. There are alot of online lists on stuff to bring on travel trips, but they’re never well catered for more than a week stay or assume far too many things about my lifestyle. 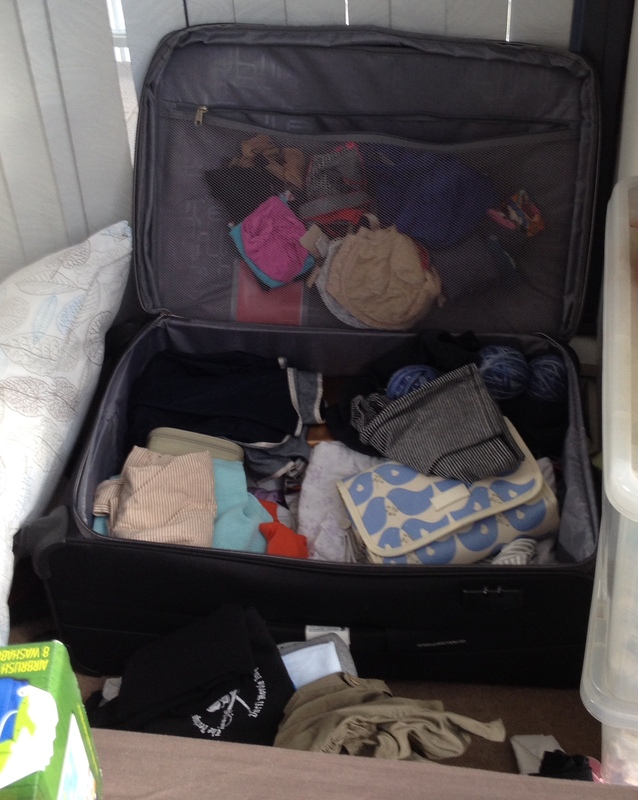 Currently, I’m using a little program called Packing Pro to help me with packing my suitcase. While I find the expert help wizard somewhat useful, it really assumes far too much about my lifestyle and often suggests inappropriate things to bring. Also, it doesn’t often take into account the reasons behind my trip and sometimes suggests inappropriately bulky and silly things to bring, like umbrellas and binoculars. Thankfully, I now have one of those massively oversized American Tourister DC Superlites, which means that packing for me now consists of just lobbing clothes into the case and then sitting on it to zip it shut. 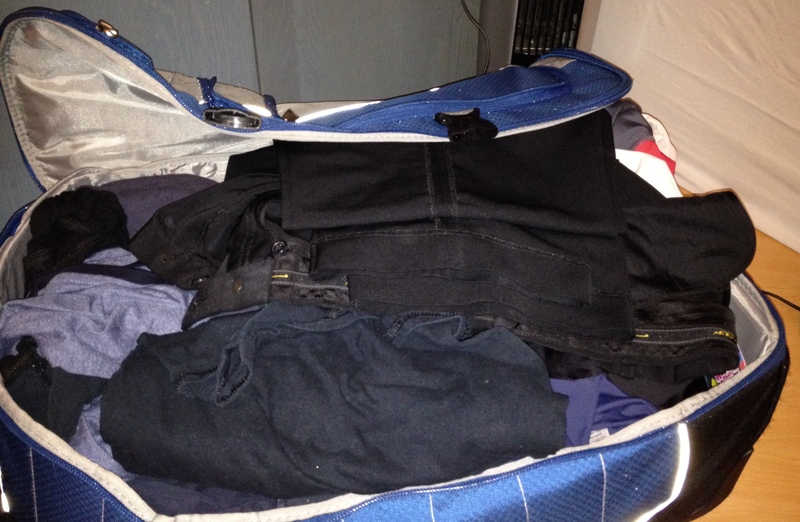 So, while I can stuff the suitcase with as much clothing as I’d like despite not knowing what clothing I might need. The result is always the same: I end up on the other side of the world from my home with something completely useless, like a Playstation 2, and missing some vital object needed to continue life, like my toothbrush. Just fling everything in there and strap it down. It’ll be all right. Meanwhile, the Southern Boobook has figured out a way to distort the laws of space and time with his packing method by fitting more things in his tiny tiny tiny suitcase. Seriously, I have no idea how he manages it because after reaching the destination, he unpacks the stuff he’s brought and then can’t fit it back in the suitcase again. It’s insane. After reaching Singapore, he unzipped it and all the clothes just burst out like that creature in Alien. Like suggesting that I bring 14 condoms on a 14-day trip to Singapore. My previous suitcase was a navy blue Samsonite lovingly nicknamed Gimpy for its broken wheel. Gimpy was a very loyal suitcase and put up with my over-stuffing him all the time and my poor handling for many years until all his locks and handles gave way. RIP Gimpy, you were too good for this sinful Earth. Not long ago, I made a Stupid Mistake. The Barn Owl and I took the kids to Sentosa for an afternoon of playing in the soft sands of Palawan Beach. A few hours later, we were all covered in a fine layer of sand and sea salt, and it was time to towel off and change into dry clothes for the journey home. Whilst walking to the public changing rooms (which were some distance away), our family got separated when we encountered a large crowd of Japanese tourists and I quickly lost sight of the Barn Owl and Little E.
Here comes the part where I made the Stupid Mistake. J and I got to the public changing rooms and I realised that the Barn Owl had J’s dry clothes in his haversack. I called the Barn Owl’s mobile phone and found that it was turned off, so I sent J into the Men’s Changing Rooms to look for him. After waiting outside the changing rooms for a while and getting no response from J, I figured that he must have found the Barn Owl and was busy getting changed…so I quickly hopped into the ladies bathroom to remove the elephant that was tap-dancing on my bladder. I cannot describe to you the feeling of absolute blind panic that completely descended upon us in that moment. Fortunately, we were able to alert one of the Sentosa security staff members very quickly, and J was found within a few minutes. Here’s the kicker – in the short time that J was missing, he’d retraced our steps from the public bathroom all the way back to the Sentosa Beach Bus Station, crying all the way. When the security staff picked him up, he was wandering up and down the Station, looking to see if we were queuing up for one of the buses. After this harrowing experience, I have learned to give clearer instructions to J and Little E, and also designate a clear meeting place for us to wait for each other if we get separated for any reason. J and Little E also know to look for a responsible adult (such as a staff member in uniform and wearing an official name tag) if they ever get lost. Additionally, they are now in the habit of carrying our contact information with them wherever they go, in the form of safety ID wristbands given to us by Carrie-Ann of My Safety ID. Thanks, Carrie Ann! Carrie-Ann, the mompreneur behind the online store My Safety ID, founded the company when she was looking for identity wristbands for her 4 year old son who had started going on excursions with his preschool. Like many parents, she was concerned that her child may get separated from his group by accident and not be able to convey their contact details accurately. The wristbands, cuffs and sports tags for helmets and shoes come in a variety of cool designs and colours, and there is not only room for emergency contact information, but also for pertinent medical alert information. 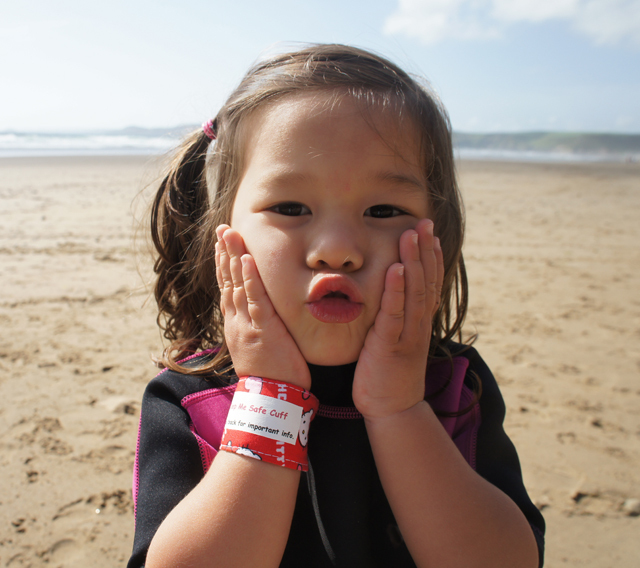 We took the wristbands and cuffs with us to our recent trip to Pembrokeshire, Wales. The wristbands are comfortable and latex-free, and the velcro allows for a customised fit that is very secure, allowing the bands to stay on during the high levels of activity associated with preschoolers. 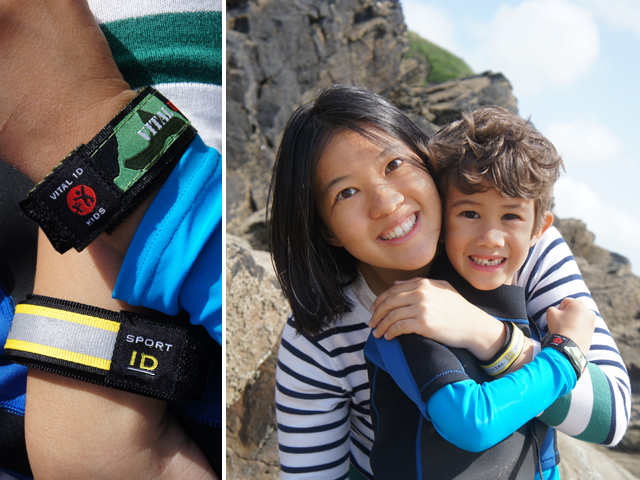 They are also 100% waterproof, keeping the hidden ID cards safe and dry, even when completely immersed in seawater. The adult Sport ID version has a highly reflective 3M Scotchlight surface which is great for people who exercise outdoors in low-light conditions, and the band can also double up as a watch or heart rate monitor strap. And it looks pretty cool too! 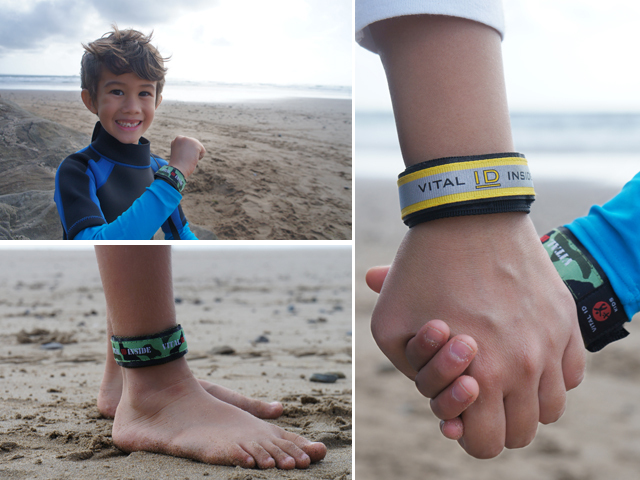 Imagine if you got matching wristbands for all the family – that would be so cute! J really likes wearing his Child ID wristband in the Green Camo print, which makes him feel important ‘like a Real Soldier’. He was also excited about the idea that there was a special safety message hidden inside the wristband – it made him feel like a pirate, or a spy! It’s also big enough to be worn around the ankle! For Little E, who still has that soft baby skin, I decided to choose the ‘Keep Me Safe Cuff‘ in a Hello Kitty Print. This Child ID Cuff is slightly cheaper than the Child ID wristband, and is handmade from a nice soft, washable fabric which is very gentle on the skin. The cuff fastens securely with a simple and pretty pearly snap button, which Little E really liked. Oooh, it’s the Keep Me Safe Cuff. I’ll definitely be bringing these wristbands along with me when I take the kids to out to busy places! I can imagine that they will come in useful if we ever decide to make a trip back to Tokyo Disneyland, busy London or even on another day out at Sentosa. Fortunately, J and Little E have not got any life-threatening allergies and do not suffer from any underlying medical conditions, but I imagine that these wristbands would make a great and much more fashionable alternative to medical alert bracelets, especially for children and adults who have difficulties communicating their needs. You can find more Personal Identification products at My Safety ID. A Little Something Extra for Owls Well Readers: Carrie-Ann from My Safety IDs is kindly sponsoring a giveaway of pair of Adult and Child Safety ID wristbands (worth up to SGD$60) to ONE lucky Owls Well Reader! YAY!!!! 1. Be a fan of the Owls Well Facebook page. 2. Head over to the My Safety ID website and leave a comment below telling me which product and design most catches your eye. Don’t forget to leave your Facebook account name and email address so that I can contact you if you win – or if you are really shy, you can email 4owlswell@gmail.com with your details separately. 3. (Optional) To double your chances of winning, share or reblog this giveaway on any form of social media that you fancy and leave a comment below with the link! Edit: This Giveaway is now over and the winner has been emailed! Thanks for playing! So here’s the last and final episode of ‘The Gifford Garden’, in which J brings us to the allotment and hows us how to plant runner beans into the ground! P.S. Watch all the episodes of ‘The Gifford Garden’ here. NO. Homeschooling is not very popular in Singapore. In most families, both parents will return to the workforce a few months after their children are born. This is a decision that is supported by our local government, which offers childcare and domestic helper subsidies, extra paid leave days as well as tax breaks for working mothers as well as additional paid leave and tax rebates for working fathers. The Singapore mainstream education system may be both rigorous and rigid, but it is affordable and effective. Children who attend school in Singapore will receive a reasonable level of literacy regardless of which school they do attend, in a safe and secure environment. I have yet to meet a Singaporean from the mainstream school who is unable to read, write and have a basic knowledge of math, science and local history. Most parents lack the skills to teach children and have no clue where to start. This is important especially considering that parents who intend to homeschool in Singapore must have approval from the Ministry of Education to do so, and this includes submitting a curriculum that meets the national standards. Children who are homeschooled must still reach the PSLE benchmarks. Homeschool creates a more sheltered and controlled learning environment for children to learn at their own pace. This is especially relevant for kids who have special learning requirements or interests. The teacher-student ratio in a homeschool is practically 1:1. It’s essentially full-time private tuition. Parents can be in charge of imparting values important to their family, without the taint of outside influences. This also means being able to choose like-minded homeschooling families to socialise with. I have noticed that most parents who choose to homeschool have some form of teacher training or experience, but there are quite a few parents who are quite happy to learn on the job. Unlike myself, these parents all tend to be very patient, highly creative and extremely well-organised individuals. 1. Jus from Mum in the Making. I love the way she organises her lessons. For example, she is currently teaching her kids about the solar system, so she has drawn it all out on her chalkboard wall in the kitchen, and also had them working on crafts related to stars. Her personal weak point is in the Chinese language, so for that she’s clubbed together with some other homeschooling parents to form a chinese immersion study group! 2. Ka-ren from Mum’s Calling. She has a very holistic approach to learning, often taking her kids on field trips and creating teaching aids from everyday materials. My favourite posts are where she teaches math concepts by using a song and a couple of pot lids, and then brings the kids to the beach to count sand. Personally, I do not feel that I can handle the pressure of being the sole educator for my children nor am I adequately equipped with the skills necessary to teach or formulate a cohesive curriculum. This is why I’m happy to outsource the teaching to the well-trained educators at J and Little E’s school. However, I do like to supplement their formal school education with some home-based learning which doesn’t have to follow any fixed curriculum. I truly believe that this encourages autodidacticism, which should be the true goal of pedagogy. For my afterschool learning, I use a combination of excursions, books, online resources, and crafts – and over the next couple of weeks, I’ll give you some examples of how I use these learning methods to supplement J and Little E’s education. Find out about the Singapore Ministry of Education Guidelines on Homeschooling here. Find out more about the Homeschooling in Singapore here. I TOTALLY PASSED BOTH MY CLASSES! 80% on both classes. Distinctions for everyone! HOORAY! Now that I’m finished with my exams, I can spend some time relaxing, working on my own personal projects and engaging in the delicious frivolity of the Internet! And guess what? Crash Course has just released the first of the new episodes that constitute Season 2 of Crash Course World History and it totally mentions Singapore! EEEEEEEEeeeeeeEEE! Given the high quality of the teaching in the first season of the series, I am really looking forward to seeing John Green cover the history of non-European civilisations. After all, what better way is there to celebrate the not needing to learn than with more learning? Incidentally, I am highly intrigued with the recent trend of available online learning. Homeschooling is not uncommon in Australia, particularly in the far away areas of the woopwoop, so I think that it’s good that materials are being made available for parents to teach their kids with. Is homeschooling popular in Singapore? A highly technical term denoting a far away place in the middle of nowhere. So, now that I have a better idea about how to choose clothes and accessories for myself, it’s time to figure out how to put my best face forward! I have terrible history with cosmetics. I learned how to put on warpaint in secondary school during my choir girl days, which really means that I learned how to plaster my face with thick layers of foundation and powder, applied liberally with crumbling cosmetic sponges. Yum. Every episode was a sticky and greasy experience which I did not enjoy. I had pretty decent skin throughout puberty but that stopped as soon as I turned 18 and moved abroad for University. My skin reacted to the change in climate by producing bountiful crops of acne. Since then, I’ve been wrestling with my skin and trying to get it under some semblance of control. Applying concealers, BB creams and foundation seemed to make things worse, which is why I avoided makeup altogether for many years, only wearing it on very special occasions (like my own wedding). In the last couple of years, I have been working on improving my complexion and I find that my attitude towards makeup has been changing Right now, I have reached the stage where I feel that I can use cosmetics intelligently. I like the idea that I can use makeup to explore and portray my own individuality and femininity. One of my good friends from school, Yva, has perfected the art of the winged eyeliner, and she gets excited whenever Urban Decay releases a new eye shadow palette. I have to say that I am envious of how she uses her own face as her canvas. Anyway, it is with this in mind that I decided to return to the Dream Factory pop-up store at Isetan for a makeup and hairstyling session with Inès Ligron. Since I know virtually nothing about cosmetics and the techniques of makeup application, I decided that this would be my chance to ask ALL THE QUESTIONS!!! 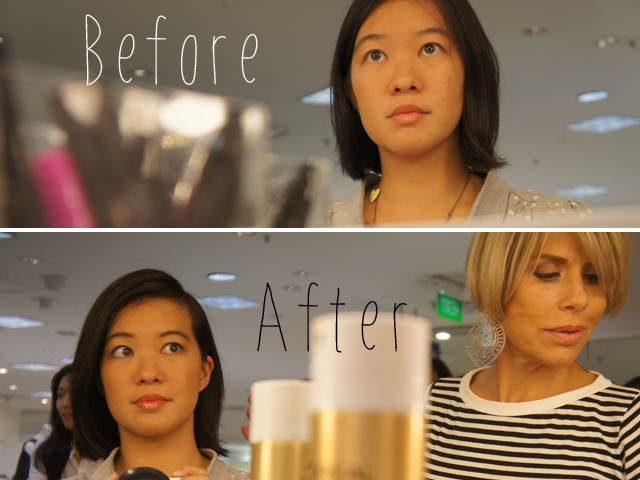 I also asked Inès to give me an easy breezy day-to-evening look for a busy mom on-the-go. 1. Less is more – for an everyday look, concentrate on 3 main areas: brows, eyes and lips only. 2. Foundation and concealer is absolutely not for daily wear – not only does it settle into the fine facial lines, making a woman appear more aged as the day wears on, but it is also not very good for the skin if worn consistently. Save it for special occasions lasting a few hours only (e.g. occasions like weddings or fancy dinners), and spend your efforts on improving your skin quality instead. 3. A good moisturiser is as good as a facial. If you’re going out to dinner or lunching with friends, give yourself an extra skin boost by applying a hydrating shimmer cream like M.A.C Strobe Cream instead of foundation. 4. If you are preparing for a special occasion and you are using foundation, instead of spreading it directly onto your face, put a small dollop of foundation (about 1cm in diameter) on the back of your hand and use the tips of your fingers to pat, smooth and blend it on your face in a very thin layer. This small amount should be enough to cover your whole face (including eyelids), neck (including the back of your neck) and ears. 5. When applying foundation or shimmer cream, always make sure that you cover any exposed skin from the elbows up with the same stuff to keep it even and natural-looking (another small dollop will suffice). You don’t want to look like you’ve photoshopped a mask onto your head. Inès recommends: For young ladies who are still schooling, remember that your beauty is in your youth. Makeup for students should be subtle: Eyebrow liner, mascara and lip gloss only. Nothing else. 6. Perfectly groomed eyebrows frame your face and give your features definition, giving you a polished appearance without the use of expensive cosmetics. Keep your eyebrows tidy and well-shaped by following these guidelines or (if you’re a first-timer who has no clue what to do) a quick visit to a professional salon like Browhaus would be a good beauty investment. 7. Eyeliner helps to draw attention to the eyes in a very subtle manner and provides a visual anchor for eye makeup. 8. There are no ‘correct’ colours for eye makeup – wear whatever colours make you feel good that day! Dark eyes especially look very good in all sorts of jewel-tones and bright colours. Try to pick colours that contrast with the dominant colour in your outfit, so that you don’t look like you’re wearing a uniform. 9. Mascara is a cheap and easy fix for tired eyes – drugstore brands like Maybelline are good enough! Apply two strokes to the top of the eyelashes, and one stroke underneath. Try to add some mascara to your lower lashes too. 10. Avoid applying too much blush by shaking the brush vigorously to remove excess powder before circling the brush on the apples of the cheeks. Brushing a line of blush on the cheekbones gives a weird striped appearance. 11. A tinted lip gloss provides a subtle lustre and finish, and is quick and easy to apply. Inès is a brand ambassador for Avon cosmetics and has created her own line of cosmetics suitable for asian women. 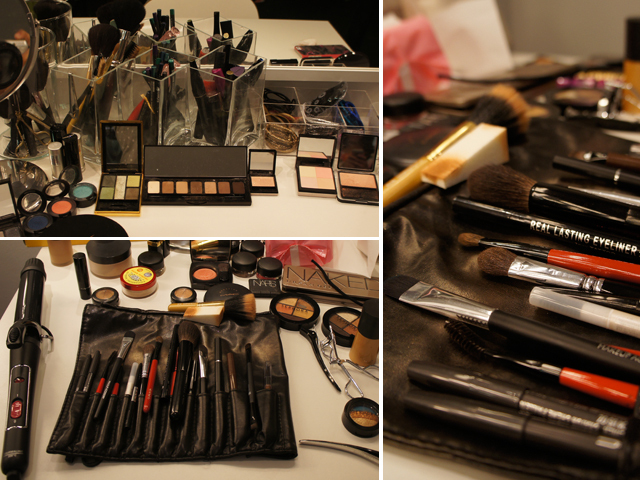 She also uses many different cosmetic counter brands such as M.A.C., Urban Decay, NARS, Stila and Sephora. Experimenting with different cosmetic brands is part of the fun! 12. To finish off a look for the evening, part your hair a little bit lower than usual to make your overall appearance much more edgy. 13. Give body to your hair by backcombing the top sections then add a quick spritz of hairspray to the roots of your hair. Use a hairdryer to give a 2 second blast of warm air to the roots of your hair, followed by a two second blast of cool air to lightly set the hairspray. Use a brush to smooth the hair out gently and tidy away flyaways strands. Left: Makeup done, time to fix the hair Right: The Hair Is Done and Inès LIgron is pleased with it! It’s a little bit difficult to describe the whole process and experience of being made up by a professional makeup guru and expert beauty queen wrangler, so I made a little video to show you how it was all done. I really did learn a whole lot about how to use and apply makeup, and how to style my own hair from just this one quick session. At the Dream Factory’s ‘transformation classes’, Inès teaches exactly how to use various tools and techniques to create your own signature look for different occasions and also how to style one’s own hair in different ways. I think those are wonderful skills to learn and would really empower women, giving them the confidence to take charge of their own appearance! Now I just need to actually go out there and purchase some warpaint! P.S. Check out Part 1 of my Dream Factory experience here.